Using HTTP in Angular we are going to fetch data from the web server, We will make a call to the web server that will in return provides data. For better understanding this process we need to know what is HTTP call and what is observable that is returned from the HTTP call. 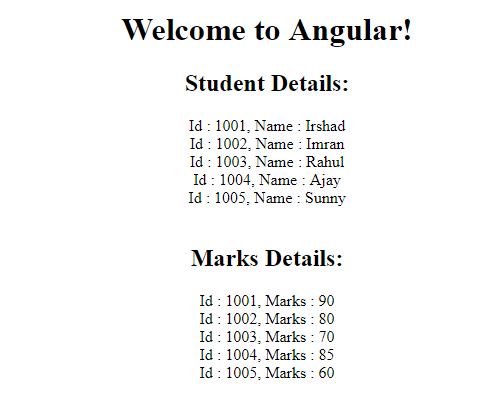 Using HTTP in Angular we are going to fetch data from the web server. We will make a call to the web server that will in return provide data. For a better understanding of this process, we need to know that what HTTP call is, as well as what is observable that is returned from the HTTP call. See my previous article “Services in Angular” and create the Application using services. So far what we have done is to give the data array that has some values directly to the component. Now, what we need to achieve is to return the same data but with the help of HTTP. 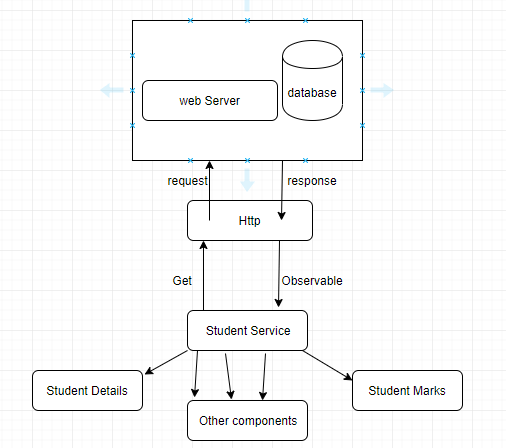 In the above diagram, the studentService will call or make the HTTP request from the HTTP module. This HTTP request will hit the web API or service that will in return fetch the data from the database and send it back as an HTTP response. This response that we are getting from the HTTP is nothing but the observable. Now the observable needs to be cast to the particular type and the studentService will cast this observable data to the array of employee and return it to the subscribed component. HTTP is just a two-way process, first is to send the request and second is to receive the response. The web API/service or the database is only responsible to give the data and their job is done. Components subscribe to the service and receive and operate the data accordingly. Student Details may only display id, the name of the students, whereas Student Marks component will display id, marks of the students. Make a request from StudentService. Get the observable and cast it. Subscribe the observable to the components. Store it to the local variables to make it useful in your component. Let us start using the HTTP functionality. Create json file on location ‘/assets/AppData/students.json’. Right now we are using the JSON file to get the data. When the data will come from web API or services then we just need to change the requesting URL. You can also use ‘any’ in observable cast. Added HttpClientModule in our application. Injected this as a dependency injection in our studentService. Invoked the get method of from instance HTTP with proper URL. The get method returned the observable that we cast to IStudent array type. We have method getStudents() that will return the observable. The observable will not return any data until some component subscribes it. When we subscribe we get the data and assign it to the property in that component class and bind it to the HTML view.